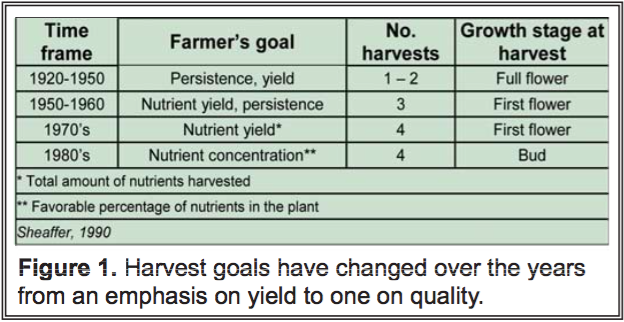 Our improving knowledge of the relationships among alfalfa yield, quality, and persistence has greatly influenced harvest recommendations made to farmers. Consider this timeline of how alfalfa harvest management has evolved through the years (Figure 1). When we give the plant more time to grow before harvesting, yield increases, but at the expense of feed quality. When we cut the plant early, we capture a higher quality feed, but this is at the expense of total yield. Previous studies of the trade-off between yield and quality usually examined this relationship on an annual basis. However, a recent study had a different approach. What is the trade-off between yield and quality for each cutting within the growing-season? When does harvest management have the greatest impact on potential milk production? Our study was conducted at three locations – Central Pennsylvania, South Central Wisconsin, and South Central Idaho – during the 2005 crop season. We planted three varieties at each location with similar fall dormancy, disease resistance and recovery after cutting. 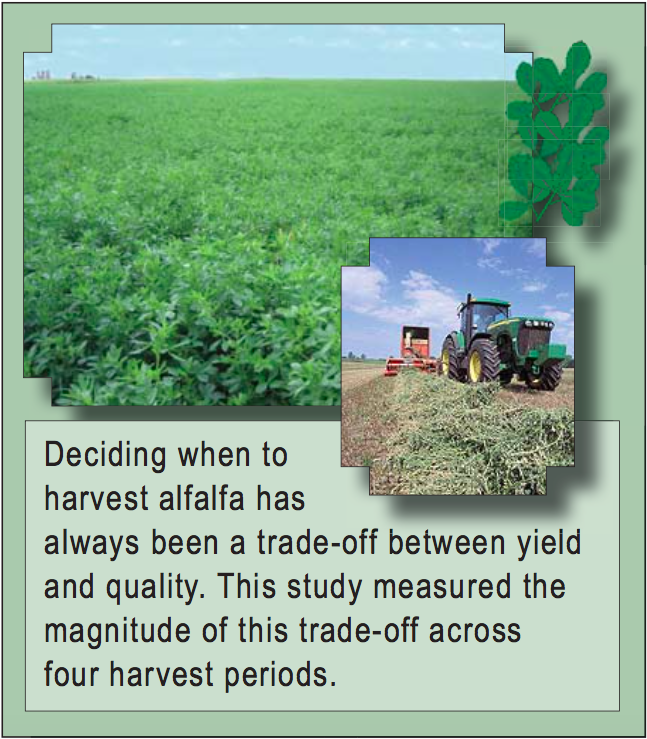 At each location, alfalfa was harvested during four periods – spring, early summer, late summer, and fall. During each harvest period, different plots were cut five times, each cut five days later than the previous one. The date of first cut for each harvest period was as follows: May 11th (spring), June 18th (early summer), August 4th (late summer) and September 12th (fall). 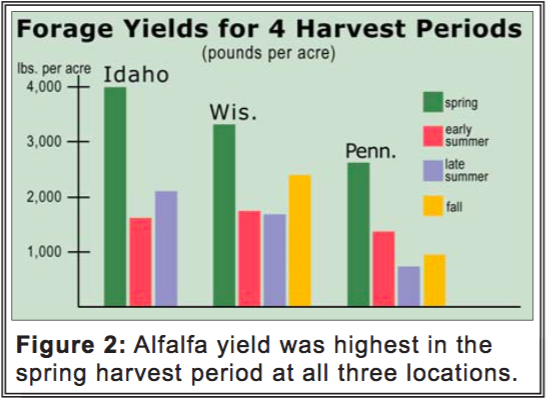 Yield was highest for the spring harvest period at all three locations (Figure 2). Quality (measured as NDFD, the portion of the total NDF that is actually digested) was highest for the spring harvest period for two of the three locations. In Pennsylvania and Wisconsin, the greatest rate of dry matter production occurred during the spring or early summer harvest periods due to optimum temperatures and moisture. In Idaho, forage production was dependent on and maximized under irrigation beginning in early summer. 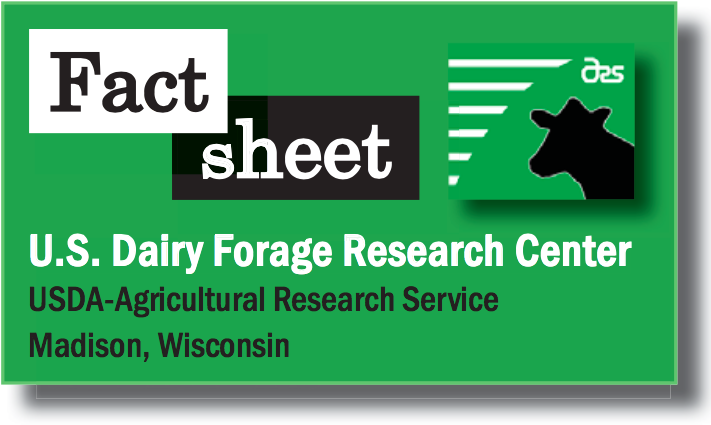 At all three locations, forage quality declines most rapidly in the early summer. In Pennsylvania and Wisconsin, the decline in forage quality in slowest in late summer. Another way to express the results is by using an index (Milk 2000) that combines forage yield and quality into a single term to estimate milk production. It is based on potential pounds of milk per acre versus alfalfa maturity. 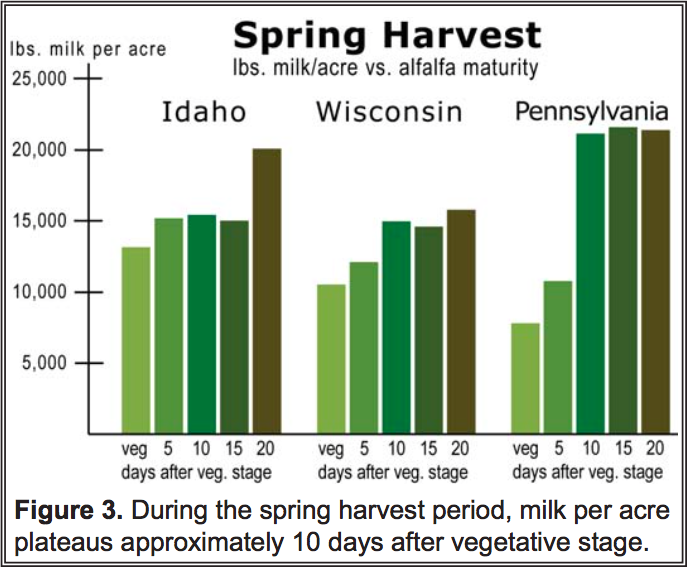 During the spring harvest period, milk per acre plateaus approximately 10 days after vegetative stage (Figure 3). 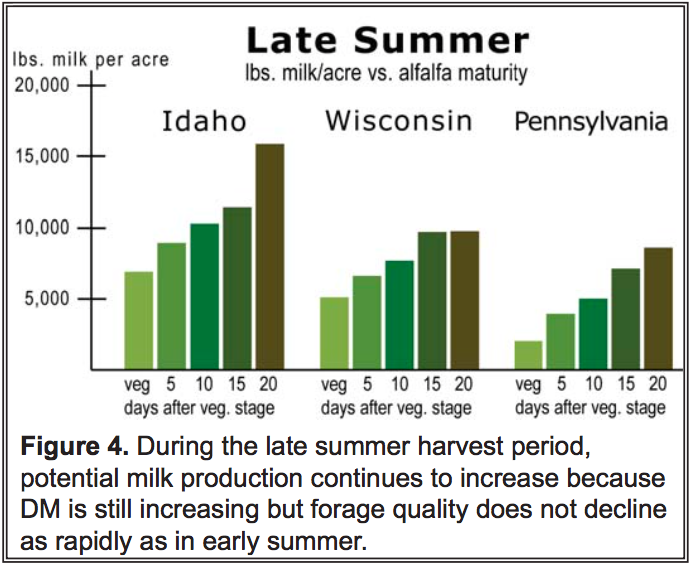 During the late summer harvest period, potential milk production continues to increase because yield is increasing while forage quality does not decline as rapidly as in early summer (Figure 4). Forage yield and quality are usually highest in the spring. Under conventional management (no irrigation), forage yield increases the forage quality declines most rapidly as alfalfa matures during the spring and early summer. Harvesting within 10 days after vegetative stage in the spring and early summer provides optimum milk production the dairy quality hay. Harvest in late summer can be delayed because digestibility declines more slowly than during the spring and early summer.